Johannes Kepler (1571-1630) was one of the best early astronomers and a very able mathematician. His published works, in Latin, included his 1596 'Precursor of Cosmographic Dissertations', his 1609 'New Aetiological Astronomy', his 1611 'Dioptrics', his 1619 'The Harmonies of the World' and his 1618-21 'Epitome of Copernican Astronomy' naming his 'giants' in the preface to Book 4 writing that he built his astronomy physics 'from the hypotheses of Copernicus, the observations of Tycho Brahe and the magnetical science of William Gilbert' - and he was also somewhat of a friend of Galileo. And nicely distinguishing hypotheses, observations and science. Kepler's 1627 'Rudolphine Tables' allowed the positions of planets to be approximately computed and most importantly predicted, making Kepler the foremost astronomer of his time. His optics work was also useful. However, here we consider Kepler's theories for explaining his astronomy - first two mathematical fictions he never fully abandoned then (after briefly supporting Gilbert attraction physics) a third weak push-physics causal theory based on ancient greek Atomism that did not really explain it and was later actually entirely disproved by Newton though without him claiming that and anyway most physicists of the time rejected Newton's physics till much later after textbooks had converted it into the Cartesian Newtonian physics that is still taught wrongly as being Newton's physics. Kepler stated that this work of his was designed to serve as a supplement to Aristotle's 'On The Heavens', for these were times when Aristotle had commanding support from Christian churches, many governments, and most scholars. Though in 1600 England William Gilbert had been somewhat braver in dismissing Aristotle as irrelevant to science, it was a time when scientific thinking risked imprisonment or even execution. In reality both rejected substantial if different parts of Aristotle as some others were also doing at the time. Kepler's early attempts at an 'astronomy science' were based on a view of the universe having been created by a God having chosen to create a musical universe or a mathematical universe along the lines of ancient-Greek Pythagorean ideas but based on 5 notes rather than 7 and on the 5 Platonic regular solid polyhedra. His early creationist physics were both basically mathematical logic attempts at a logical-universe astronomy. Early-Kepler physics involved a view of some godly mathematics being primary in the universe, so he tried producing a Geometry Mathematics Physics and a Music Mathematics Physics. Others like Euler supported similar physics theories, though attempts to produce a physics from mathematics seems to have given many dud theories. (Einstein and post-Einstein physics also seem to have produced mathematics-derived theories, with Wave Mathematics Physics and Quantum Mathematics Physics ?) But Kepler's pre-1600 mathematical-universe 'Mysterium Cosmographicum' showed that, unlike most others, Kepler seemingly saw mathematics as somehow 'physical'. This maybe reflected William Gilbert, unlike most others with their deterministic push-physics, seeing that at least some of the non-mechanical could also be deterministic ? Of course in 1600 Kepler studied William Gilbert and for a time at least concluded that the universe though maybe conceptually mathematical is NOT physically mathematical but is 'Experienceal', though Kepler's physics then went from temporarily a Gilbert 'signal response' experience to a Galileo greek-Atomist Descartes 'touch' experience possibly on some pressure from Galileo. For a time Kepler like Galileo supported the astronomy of Copernicus only as a push-physics astronomy, though Gilbert and Newton realised that only an attraction physics could actually explain planetary motions. But between Kepler's different published astronomy theories he did seem to have had a brief period of favouring Gilbert's attraction physics which may possibly have really helped him develop his astronomy maths, as it later helped Newton develop his. This he indicated in a June/July 1600 essay dedicated to Archduke Ferdinand in which he supported a vague force-based hypothesis of lunar motion - 'In Terra inest Virtus, quae Lunam ciet' ('There is an influence in the Earth that triggers the Moon to move') per Max Caspar's Kepler, p.110. Einstein however reverted to another form of 'push-physics without push' that was really without explanation though with useful maths. Kepler's discovery of his Three Laws of Planetary Motion seems to have developed chiefly from his study of the orbit of Mars under Tycho Brahe, continued beyond Brahe's 1601 death still using Brahe's detailed observational data. He seemed to have developed his elliptical planetary orbits and his first two laws by 1605 though publication was delayed till 1609, and he seems to have developed his 3rd law later in 1618 and published that in 1619, see Kepler. But early science could be very competitive as with Galileo refusing to help Kepler obtain a telescope (see Philip Ball) and also unreasonably rejecting Kepler's proof that planet orbits are elliptical and not circles. Kepler was however somewhat helped by one or two catholic Jesuits (see Thonyc ). But it is known that Kepler was also studying William Gilbert's 1600 'De Magnete' early in this period, and it claiming proof of causal action-at-distance forces operating between solar system bodies that might give non-circular planetary orbits. And Kepler did himself publicly acknowledge the major contributions of both Brahe and Gilbert to his astronomy ideas. His first two laws of planetary motion were developed from 1600 to 1605 as (1.) The orbits of the planets are ellipses with the Sun at a focus and (2.) 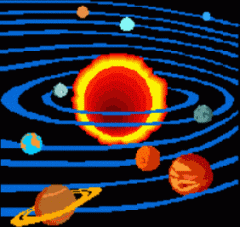 Planets sweep out equal areas in equal times in orbiting the sun. They were published in his 1609 Astronomia Nova (A New Astronomy) with the third law added for his 1618-21 Epitome of Copernican Astronomy as (3.) The square of the orbit time for a planet is proportional to the cube of its distance from the sun. But these were only good to an approximation and without real explanation. Kepler's 1618-21 'Epitome of Copernican Astronomy' used many of Gilbert's magnetism phenomena and illustrations (but not always correctly) for an astronomy that explained the motion of planets and moons. Gilbert had developed a non-magnetism signal response attractive force astronomy theory in outline, of which Kepler had at least some general knowledge that he did not acknowledge and he maybe did not include this non-magnetism force, but Kepler instead presented (as though it was Gilbert's theory) a theory of his own involving the claim that planets, moons and stars were rotating magnets and their magnetism maintained planet orbits with forcefield-thread vortexes acting mechanically. He also seems to have failed to inform Galileo of Gilbert's basically correct theory of Earth's tides when Galileo was working on a quite wrong mechanical theory, and he included a useless but popular argument against a 'mind' parody version of Gilbert's actual signal-response or attraction theory. He had studied Gilbert's De Magnete whose Book 6 gave only a basic statement of Gilbert's conclusion that tides are chiefly caused by the gravitational attraction of the Moon, and may or may not have also studied a manuscript De Mundo where Gilbert detailed his tides theory. However, Kepler never fully abandoned his God-mathematic astronomy physics, in 1621 publishing an expanded second edition of his 1596 Mysterium Cosmographicum. "But isn't it unbelievable that the celestial bodies should be certain huge magnets ? Then read the philosophy of magnetism of the Englishman William Gilbert ; for in that book, although the author did not believe that the Earth moved among the stars, nevertheless he attributes a magnetic nature to it, by very many arguments, and he teaches that its magnetic threads or filaments extend in straight lines from south to north. Therefore it is by no means absurd that any one of the primary planets should be what one of the primary planets, namely the Earth, is." "the material globe would have no faculty of obeying or of moving itself." and "it is asked by what means the mind knows where the centre is, around which the orbit of the planet should be organised ; and how great the distance of the mind and its globe from that point is." "Then does the Sun by the rotation of its body make the planets revolve ? And how can this be, since the Sun is without hands with which it may lay hold of the planet, which is such a great distance away, and by rotating may make the planet revolve with itself ? Instead of hands there is the virtue of the body, which is emitted in straight lines throughout the whole amplitude of the world, and which - because it is a form of the body - rotates along with the solar body like a very rapid vortex ; moving through the total amplitude of the circuit whatever magnitude it reaches to with equal speed ; and the Sun revolves in the narrowest space at the centre. Can you make the thing clearer by some example ? Indeed there comes to our assistance the attraction between the loadstone and the iron pointer, which has been magnetised by the loadstone and which gets magnetic force by rubbing. Turn the loadstone in the neighbourhood of the pointer ; the pointer will turn at the same time. Although the laying hold is of a different kind, nevertheless you see that not even here is there any bodily contact. Then what takes place now by the Sun's rotating around its axis ? Indubitably by the turning of the solar body the virtue too is turned, just as by the turning of a loadstone the attractive force of one part is transferred to different regions of the world. And since by means of that virtue of its body the Sun has laid hold of the planet, either attracting it or repelling it, or hesitating between the two, it makes the planet also revolve with it and together with the planet perhaps all the surrounding ether. Indeed, it retains them by attraction and repulsion ; and by retention it makes them revolve." "Whence do you prove that the matter of the celestial bodies resists its movers, and is overcome by them, as in a balance the weights are overcome by the motor faculty ? This is proved in the first place by the periodic times of the rotation of the single globes around their axes, as the terrestrial time of one day and the solar time of approximately twenty-five days. For if there were no inertia in the matter of the celestial globe - and this inertia is as it were a weight in the globe - there would be no need of a virtue in order to move the globe ; and if the least virtue for moving the globe were postulated , then there would be no reason why the globe should not revolve in an instant. But the revolutions of the globes take place in a fixed time, which is longer for one planet and shorter for another : hence it is apparent that the inertia of matter is not to the motor virtue in the ratio in which nothing is to something. Therefore the inertia is not nil, and thus there is some resistance of celestial matter. Secondly, this same thing is proved by the revolution of the globes around the Sun - considering them generally. For one mover by one revolution of its own globe moves six globes, as we shall hear below. Wherefore if the globes did not have a natural resistance of a fixed proportion, there would be no reason why they should not follow exactly the whirling movement of their mover, and thus they would revolve with it in one and the same time. Now indeed all the globes go in the same direction as the mover with its whirling movement, nevertheless no globe fully attains the speed of its mover, and one follows another more slowly. Therefore they mingle the inertia of matter with the speed of the mover in a fixed proportion." "How is it possible that the virtue flowing from the body of the sun should be weaker in the greater interval at A than near the sun at E ? What weakens the virtue or makes it feeble ? Because that virtue is corporeal and partakes of quantity: wherefore it can be dispersed and thinned out. Therefore since as much power is diffused throughout the very wide orbital circle of Saturn as is collected in the very narrow orbital circle of Mercury: therefore it is very thin throughout the parts of the orbital circle of Saturn, and hence it is very feeble; but it is most dense at Mercury and hence is very strong. If it were a question of the body of the sun, I might grant to it this natural power of moving: but you draw out this material power from the body and place it without a subject in the very spacious ether. Doesn't this seem absurd ? That it should not seem absurd is clear from the example of the loadstone, to which this same objection can be made. But in neither case is this force without a proportional subject. For in this way at the very source the subject of the natural faculty is the body of the sun, or the threads stretching out from the centre to its circumference; thus even in this very emanation, I think a rational distinction should be made between the immaterial form of the solar body, which flows as far as the planets and beyond, and its force or energy which actually lays hold of the planet and moves it - so that the form is the subject of the force, though it is not a body but an immaterial form of a body. Could you give an example of this thing ? There is a true example in the light and heat of the sun. There is no doubt but that just as the whole sun is luminous, so it is all on fire, and that on account of the density of its matter it should indeed be compared to a glowing mass of gold, or to anything else which may be denser. Now from that light of the sun there emanates and comes down to us a form which is not corporeal, not material, which we call the illumination or rays of the sun and which however is subject to dimensions and accidents. For it flows on straight lines and may be condensed or rarefied, and many indeed be cut by a mirror and by glass, namely, by reflection and refraction, as we are taught in Optics. Moreover, this form of the sun's light bears its heat with it; and in proportion to the greatness or smallness of the strength whereby it falls upon bodies which can be illuminated, it warms them to a greater or to a lesser extent. Therefore just as that form or illumination - which form we know with certainty to flow down from the light of the sun - is the subject of the heat-giving faculty, which has similarly been extended from the sun, through a form; so too the solar body's immaterial form, come down as far as the planets, has as its companion the form of that energetic virtue in the solar body; and this form strives to unite like things to itself and to repel unlike. What is the likeness between the form of light and the form of this prehensive virtue ? There is a very close likeness in the genesis and conditions of both forms: the descent of each from the luminous body takes place instantaneously; each remains of average greatness and smallness without loss, is not taxed; nothing perishes in the journey from its source, nothing is scattered between the source and the illuminable or movable thing. Therefore each is an immaterial outflow, not like the outflow of odours, which are conjoined to a decrease of the substance; not like the outflow of heat from a raging furnace, or anything similar, by which the spaces in between are filled. For this form is not anywhere except in the opposite and withstanding body; the form of the light on its opaque surface, but the form from the motor virtue in the total corporeality: but in the intermediate space between the sun and the surface, the form is not but has been. But if they were to meet the concave spherical surface of an opaque body, both solar forms would be scattered in that concavity together with all that abundance with which they have emanated from the body of the sun: in this way as much of the form would be in a wide and farther-away sphere of this sort as is in the narrow and nearer sphere. And since the ratio of convex spheres is the ratio of the squares of their diameters : therefore the form will be made weaker in unequal spheres in the ratio of the square of its distance. And again because circles have the same simple ratio as their diameters: therefore in longitude the form is weaker in the same ratio of its distance from its source." Though Kepler's own theory differed from Gilbert's it was still often seen as basically an attraction by an unseen emission theory akin to Gilbert's - and some like Galileo and Descartes considered this somehow 'occult' and preferred to look for more simply mechanical if still unseen causation. Of course Kepler correctly followed Gilbert in having the Moon causing Earth tides, and additionally correctly had gravity decrease as the square of the distance from its source though incorrectly assigned by him to magnetism - basically using a Gilbert approach and logic. And while Kepler preferred his own mechanical adaptation of Gilbert's theory, he did at some points use an actual Gilbert signal attraction theory of gravity to aid explanation. He did have gravitational effluvia as sometimes material and sometimes immaterial, though he seemingly chiefly settled on an atomist Galileo-Descartes material push-physics mechanism and view of matter. But at times Kepler did almost seem to perhaps get nearer to the truth, as in this quote from one of his letters. Rather later Einstein was to make claims about the precession of Mercury that disputed Kepler's laws of planetary motion but he put as disproofs of Newton and little effort was made to find alternative explanation such as eg the Sun's magnetism with its 11-year cycle. Like most early scientists Kepler had to do paid work, in his case chiefly as an astrologer - and was a somewhat unconventional Christian, in his case an excommunicated Protestant. Kepler's general forcefield idea was basically reflected in Maxwell's forcefield theory and in Einstein continuum theory, but with these seemingly requiring that something non-mechanical, which cannot be pushed by objects, can be mechanical and push objects. And somehow selectively, when anything that can push should push anything that is pushable ? But 'field' and 'charge' type jargon, and ridiculous rubber-sheet 'analogies' maybe just hide selective push and other problems and avoids giving any actual testable mechanical push explanation ? Kepler claimed his emitted forcefield acted in a simple mechanical push manner on bodies, but maybe just required forms of emitted energy that have only little interaction with matter, but when they do interact can produce motion - maybe something like the photo-electric effect where atoms can emit a massive electron in response to an incoming little photon ? Field theories have involved various strange logics that generally are not clearly specified. © new-science-theory.com, 2018 - taking care with your privacy, see New Science Theory HOME.